Trilogy of a Happy Birthday – Episode III: The Warriors’ Assembly – Nina, the Von Gierke’s warrior! Nina, the Von Gierke’s warrior! 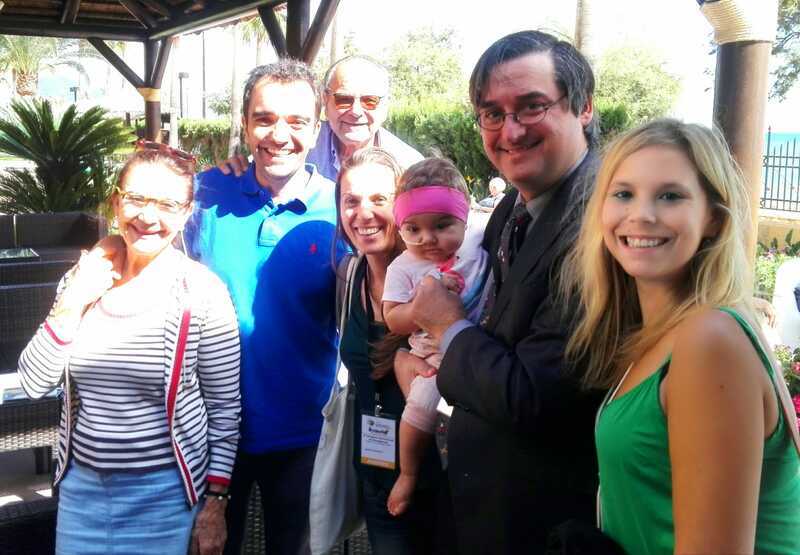 I was very much excited when I got to the Hotel hosting the Conference because I was meeting all those GSD Warriors and their families with whom I had been in touch for months but I had never seen face to face before. 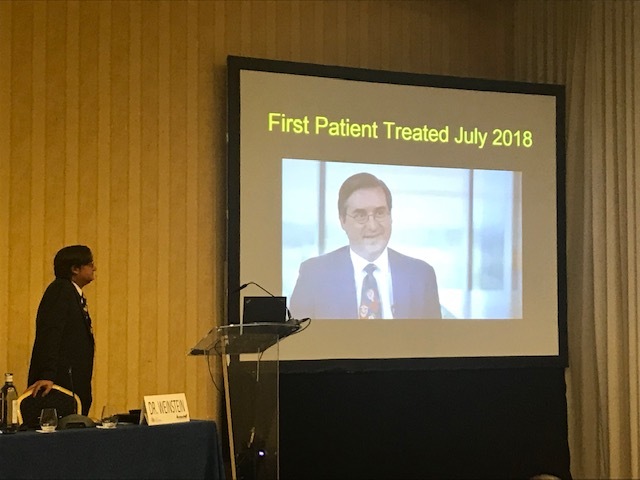 On the top of that, I was going to see Dr. Weinstein once more, to meet Dr. Nerea in person for the first time and to continue learning a lot about GSD. Luckily I took the NinaCar with me. It allowed me to spend the whole day moving around the hotel with my grandparents while my parents attended lectures and meetings with Doctors and other parents. It was the first time I went to a hotel. In the beginning it reminded me to the Hospital: a lot of rooms altogether and a lot of people who do not know each other but live together just out of coincidence. Even if I am treated well in the Hospital, the truth is I like better the hotel. In the Hotel you know that if you get a puncture is just because you are in an acupuncture session… and you can go in an out whenever you want. I had such a good time! I was not only out of the hospital but also surrounded by a lot of my Warriors friends… I loved socializing with them! I think I was the youngest one but I loved seeing how Warriors from very different ages were able to get along so well in such a natural way. I guess that the fact that we go through similar things makes easier connect and understand each other. Apart from our parents’ bags under the eyes we all had many other more important things in common: the infinite love that makes us find energy anywhere, the composure, the resilience, the strength, the courage and the will to survive which move us forward… the enthusiasm to see the light at the end of the long tunnel… and the fact that we are the kind of Warriors that never give up. Maybe it is not appropriate that I am the one saying this but… you know what? We were told that patients affected by GSD are very intelligent and sharp. Maybe nature is wise and tries to compensate the negative part of our genetic mutation with another more positive one…. Maybe we just need to be more awake as a matter of survival… or maybe this is just nonsense… but what I can confirm is that all the Warriors that I met have something very special. By the way… I saw Sophie again! She is another Little Warrior (probably the second youngest in the Assembly) to whom I met in the Hospital in Granada when I got diagnosed in April. I had just been hospitalized while in her case she was coming for a check-up. Wow… Time flies! I have lost count of how many baby-bottles I have taken since then. Sophie and my case are interesting: as you know, GSD normally affects one out of 100.000 people but the different types of GSD have different levels of prevalence. Out of the 14 GSD types, Sophie and I have the type 1b, one of the rarest ones. We are one in a million! So what a coincidence that we were both diagnosed in Granada in a period of six months. There was also Catherine, another little brave GSD 1b patient, whose family has done a lot for the GSD 1b research that we are all supporting. Her mother, Maria Jesús, is the first person with whom we talked on the phone about GSD once we were diagnosed and her advice was very useful. Her dad, Jason, is British and is also doing a lot of things in the U.K. to support the GSD Warriors over there. They are super well organized and showed us all the devices they have and how they arrange everything when they have to travel. Elizabeth, Catherine’s elder sister, was also there. She is eight years old and she already run a 5 kms race to raise funds for rare diseases. I played a lot with them and we had a very good time together. So we all formed a circle and had a session together with Dr. Weinstein and Dr. Nerea, talking about how to better control the glucose level in blood, about the neupogen, about how to deal with emergencies, how to use cornstarch… and so on… It was very interesting. We also attended the GSD 1a sessions since we have a lot of things in common with them and being such a “rookies” the more we learned the better. Belen and Rafa, Cayetana’s Mum and Dad were there. Cayetana is a GSD 1a Warrior who is a champion. She is very young but she is able to test her glucose level and to prepare the cornstarch on her own. And she gets excellent results in the medical tests! 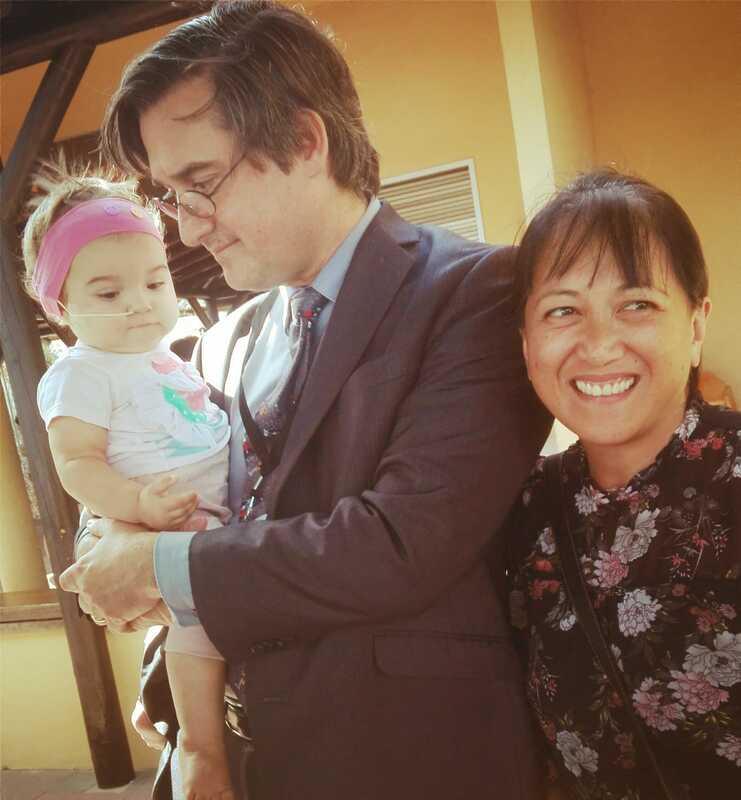 Belén and Rafa were also one of the first families we talked to when we got the diagnosis. 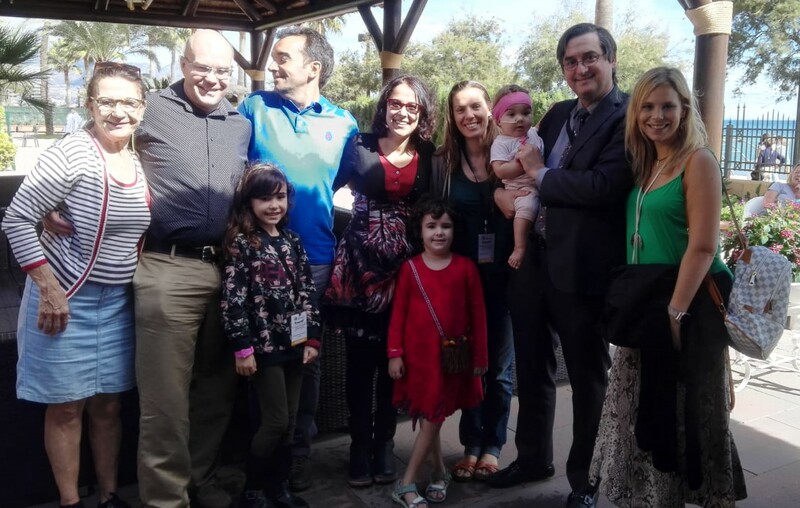 Rafa even came a couple of times to Granada to see us… one of them the day I met Dr. Weinstein. We are really lucky to have around such great friends. We were also excited about meeting Susana and Juan, the ones that had the wonderful idea of the “Charity Wine” that we all loved so much. I am sure we still have several bottles to celebrate Christmas. During these two days there were lectures about many different issues: the latest developments on gene therapy and GSD research, the management and latest news about hepatic GSD…and many other sessions about other types of GSD. 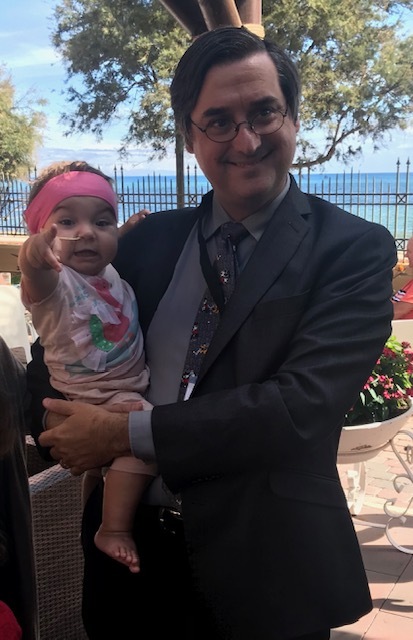 In addition, Dr. Weinstein, as usual, was always super reachable and available to see the patients one by one… from very early in the morning till late at night…. Mamma mia, he is such a great person and Doctor! 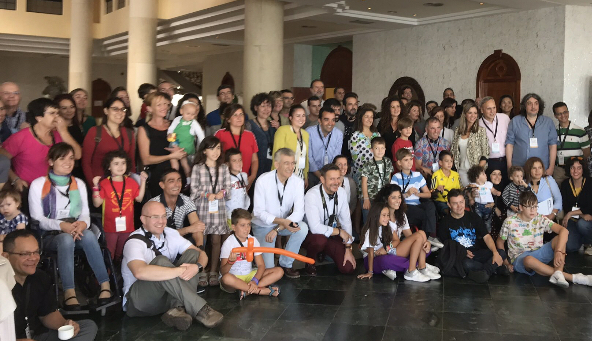 So little by little we got to Saturday night when we celebrated the Assembly of the Spanish Association for GSD patients. We are super thankful to the Association for organizing the Conference together with Glucolatino Spain. It is so good to have this kind of opportunities. We became members of the Association little time after getting the diagnosis and then my uncles, aunties, grandpas from Spain and Italy became members too. A lot of people willing to support, as always. If you wish, you could become a member too for only 30 Euro per year… Two and a half euro per month… If you feel like it, drop us a message and we will let you know how to do it. Several members of the Association and the Governing Board are doing as much as they can on a voluntary basis to move the Association forward. My Dad is now GSD 1b coordinator so we will also be supporting as much as possible. 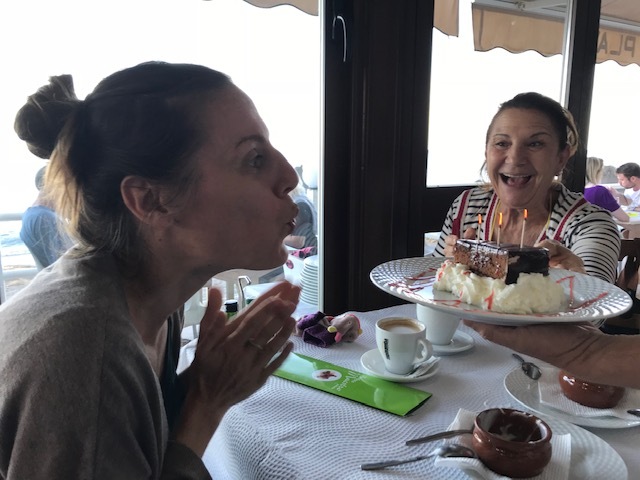 Sunday was a very special day: not only we had the chance to spend more time with Dr. Weinstein and Dr. Nerea to clarify some questions but it was also my Mum’s birthday… and the birthday of Dr. Geraldine, Dr. Weinstein’s wife. Then we went for lunch to celebrate my Mum’s birthday and the good time we had had at the Warriors’ Assembly. So this is how the trilogy of a happy birthday comes to an end… although the truth is that it was not only one happy birthday, they were three! My father’s birthday the day of the epic battle of Los Alamos, my birthday the day I met Dr. Weinstein and my Mum’s birthday in the Assembly of Warrios… Can you imagine better celebrations than these ones? Three very special celebrations which were possible thanks to all of you… we are extremely thankful! Previous post2018 review: Am I a lucky baby? Next postWarriors in Action: Little Big Human Beings (II) There’s hope! Superninac on 2018 review: Am I a lucky baby? Christopher Lourenco on 2018 review: Am I a lucky baby?